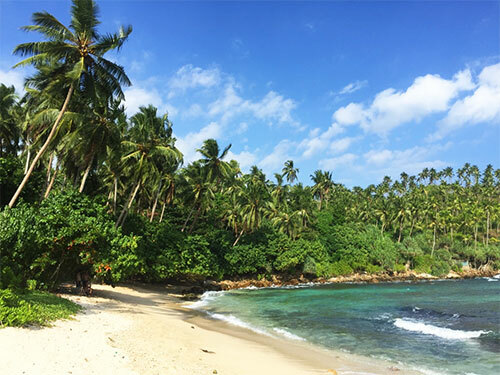 Our next stop on our beach hopping in southern Sri Lanka was the well visited beach resort Mirissa. 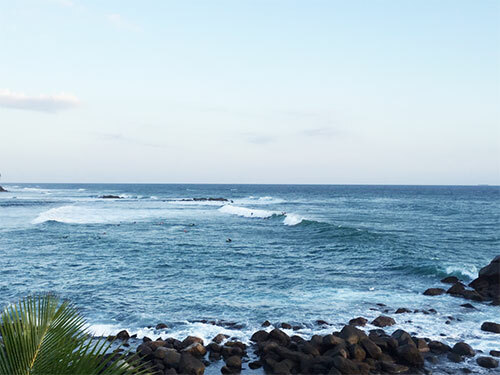 Mirissa is primarily popular as a base for whale watching. Every day a dozen boats exit the harbor, full of tourists, to see the largest animal of them all: the blue whale. Mirissa also has several beaches. Just like most beaches we visit in Sri Lanka they have quite large waves and strong undercurrents. Waves you would not let your five year old play in but for adults with a playful mind it is a lot of fun to swim, albeit a bit difficult at times. The beach of Mirissa is the obvious place to go to and this is also where we head after checking in to our guest house. The main beach in Mirissa. The photo is taken from a small peninsula by the beach that is quite nice to visit. We meet up with, Eric, an old travel companion of J. He travels all over the world and happen to be in Sri Lanka at the same time as us so we hang out by the beach sipping Piña Coladas during Happy Hour. The main beach in Mirissa is full of restaurants back to back with almost exactly the same setup: fresh fish, a long menu with Western meals, a few Sri Lankan meals and very few vegetarian meals. It is quite tiresome walking from restaurant to restaurant and see exactly the same menu setup all the time. In addition to that, each meal typically looks the same everywhere. It feels like such a waste when the country is so full of excellent food and fresh produce that they try to accommodate Western palets in almost every restaurant! Fantastic waves for the skilled surfers at Mirissa beach. Prior to our dinner J bargains a really good price for a whale safari for us (1.500 Rp per person) the morning after. 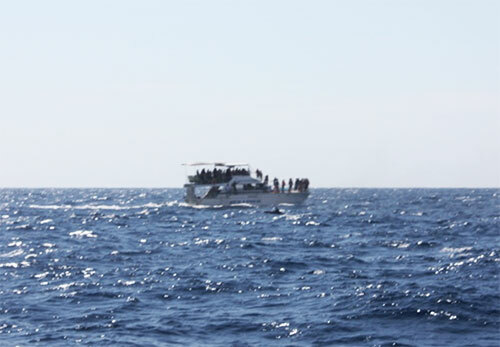 They say they have only booked 9 out of 20 places and we are promised vegetarian food on the boat and a guarantee of a new boat ride if we do not see whale. In the end the boat turns out to be full and the vegetarian meals are completely forgotten. We need to get up at 5 a.m. the morning thereafter but the night turns out to be a hell for me. It is absurdly hot in the small room and I get close to a claustrofobic feeling and do not sleep one single minute during the night. So, I spend the whale safari in the midst between sleep and being awake. I only get a bit of a pulse when the boat speeds up and turns – a sign of a whale being sighted. Dolphins jumping close to the boat. In total they were about 20-30 dolphins. 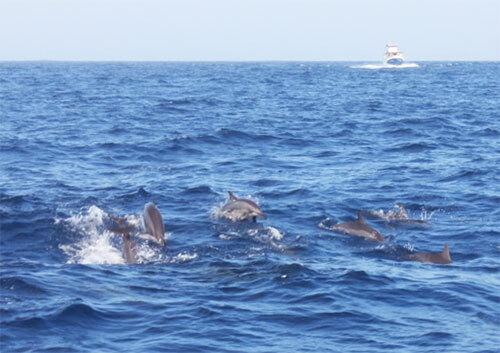 Quite early we see an impressive pod of dolphins, some even following us at the front of the boat for a while. It takes at least 2-3 hours before we see our first whale. It is very unclear what kind of whales we actually see during the day but we are fairly sure we see blue whale at least at one time. 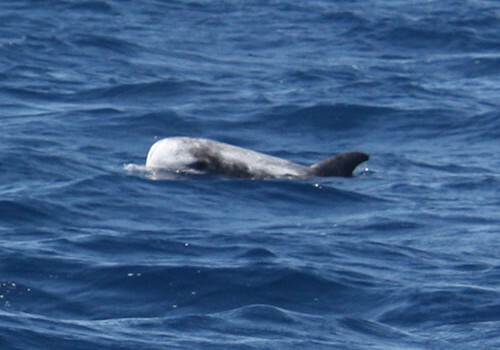 In reality they are too far away and you only see a dorsal fin or a tail fin briefly here and there so it is very difficult to be sure. The “guides” on the boat do not really say anything else outside of pointing the whales out when we encounter them so we have no real idea. As an experience the whale safari is a rather dull on. In addition, when we are going home it just takes foreeeever to reach the harbor. It feels like they are driving extra slow in order to save gas or something and we are home at about 1 p.m., some seven hours after we went out! 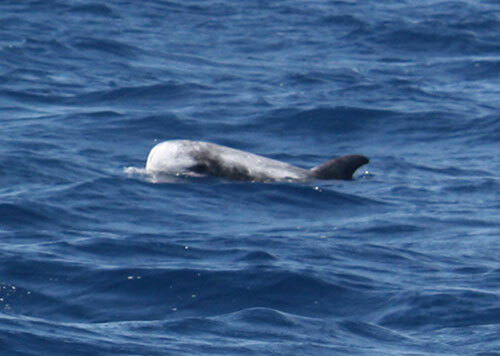 Note the dorsal fin in front of the boat. That boat came pretty close to the whale (bluw whale? who know?) but we saw all of our whales at a large distance. In conclusion, this whale safari became more about “Check, now we have (possibly) seen a blue whale” than a spectuacular whale experience. Unless your childhood dream is to see a glimpse of a blue whale or if you love to be out on the ocean, this is not something I can recommend doing. 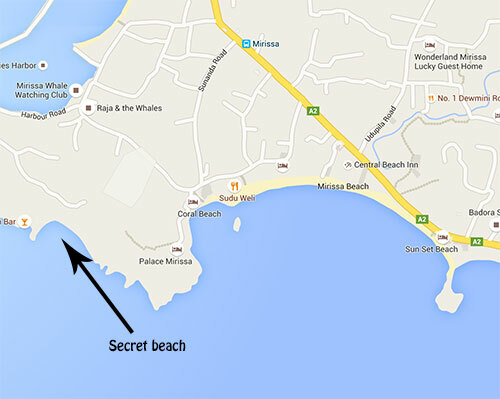 Something I can recommend however is “Secret Beach” which you can find rather close to the main beach in Mirissa. Secret Beach is not really a secret beach but it is something completely different than the tourist dense main beach. It is more difficult to reach, which acts as a filter to only let the most dedicated beach lovers to reach it. This is where you find Secret Beach. There are two roads leading there. One is slightly easier to find, over the hill (ask the tuk tuk-drivers) and through the road you can see on the map. The latter one goes through a bit of paths through dense forest and is not as easy to find your way through. Secret Beach is a very small beach divided in two beach strips with coarse coral sand, some 100 meters wide each. In return, they are both very, very pretty and it feels very exclusive even though there is a small restaurant there. When we visit the beach there is a bunch of stray dogs that makes my impression of the beach a bit less overwhelmed. It is, nonetheless, an incredible beach well worth a visit if you are in Mirissa and feel like getting away from the tourist masses. One of the two beach strips at Secret Beach, Mirissa. 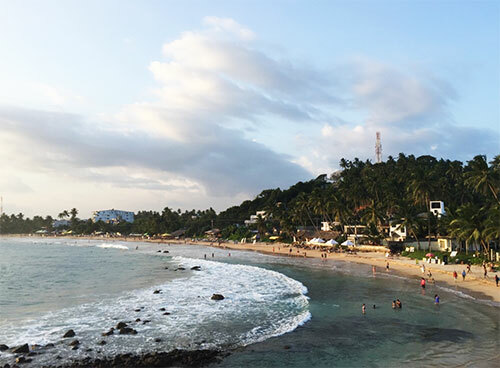 My recommendation: Mirissa in itself is probably worth a visit but I think there are better beaches in Sri Lanka unless you are looking for tons of beach restaurants and Happy Hour-bars. Skip the whole whale safari thing and spend that day on Secret Beach instead!